You are late to congratulate someones birthday, you have forget or you just didn’t think about it? No problem. 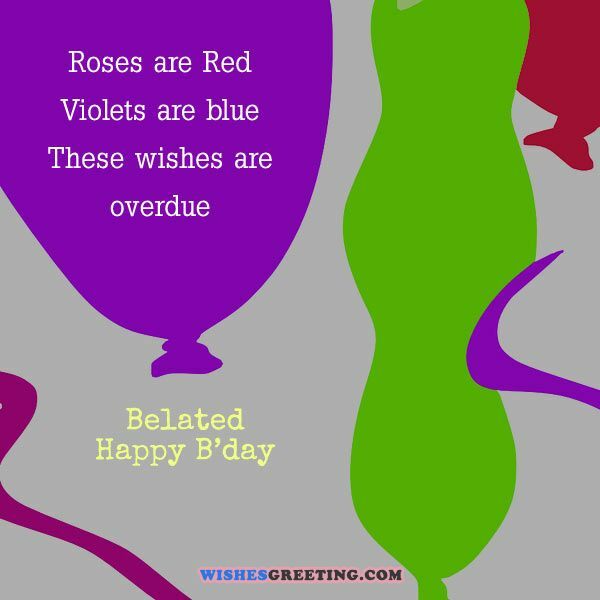 Here is solution on how to say belated happy birthday and what to write on greeting card in this case. 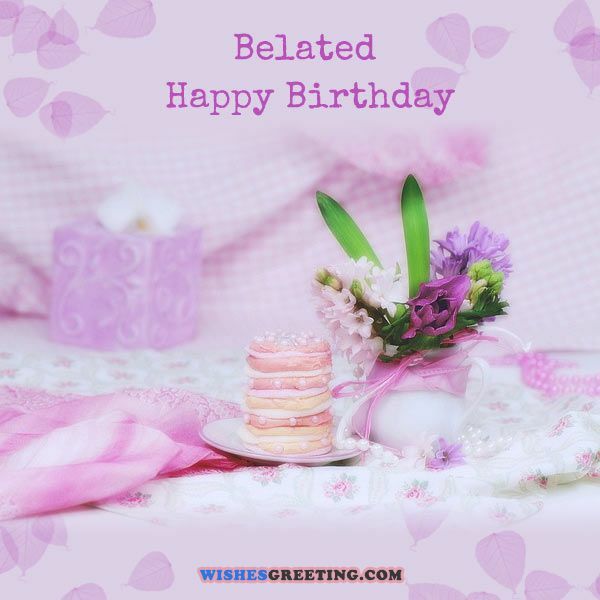 Here is list of best belated birthday wishes to help you ease the situation. People will still be happy if you are late, then never to congratulate a birthday. 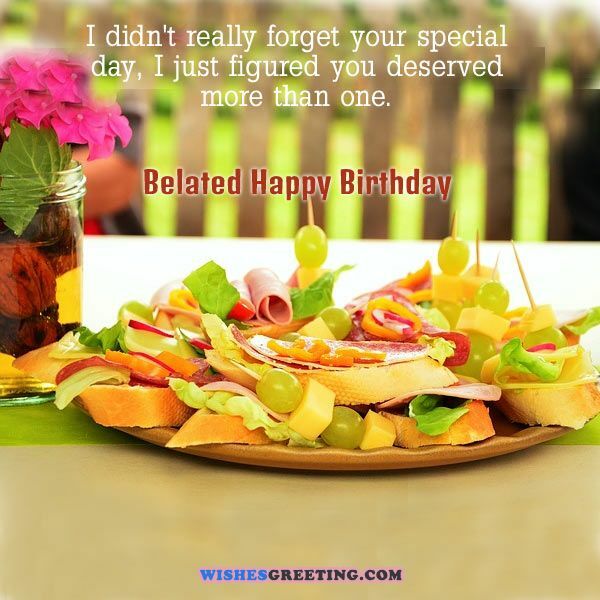 For this reason, picture says better then 100 words, you will find here belated birthday images to help expressing your feelings on belated birthday in colorful and beautiful way. You can post on them on Pinterest or Facebook, it is up to you. But here is a small tip: next time just use your favorite social network for remembering someones birthday and you will be notified ahead. I knew that it was your birthday, but I didn’t send you any message because you’re too busy with yourself in the last few months. That’s why I’m wishing you you now. Happy belated birthday. I was hundreds of miles away on your special day. I hope you enjoyed your day with a big cake. I’m sending you this message late, but it doesn’t mean that I don’t care about you. Wishing you a happy bday, because the last few days things went too busy. But your birthday never waits. Now, I’m sending this greeting for you. I forgot to wish you on your birthday, but lets have a late cheer to remind you that you had a birthday. Hope you had lots of fun. 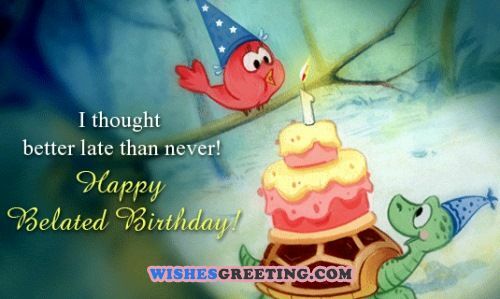 Though I’m little late, but yet I’ve a chance to wish you a very happy late birthday. I won’t miss the opportunity to wish you a happy birthday. But you know I’m fashionably late. I hope that your birthday was a wonderful one and you enjoyed that day a lot. Have an amazing year. Happy belated birthday. How did you feel while celebrating your special day on time? I wasn’t prepared for this and I’m so sorry for that. I lost the card I bought for you that’s why my wish is a little late. Hope you rocked and enjoyed a lot. I know I missed your birthday, but trust me this doesn’t happen more than once a year. Awesome belated bday. Sorry, it wasn’t my fault. Time slipped to fast that I couldn’t arrange enough time to send you a wish on time. We all know that the birthdays are special, but a person like you is special every day. Wishing you a awesome belated bday. I’m so silly that I missed your birthday. I can’t believe it that I really did it. I couldn’t catch up with you to celebrate your birthday and I’m really sorry for that. Hope you passed some great times. Wishing a happy birthday. I check the notifications everyday on Facebook, but I’m shocked that even Facebook has forgotten to remind me about your birthday. I opened my Facebook account this morning after several busy days and found some birthday wish on your wall. I’m stunned that I missed to wish you on your birthday. Hope you had great fun. I guess my trip around the sun was faster than I was expecting. May be that’s why I’m a bit late in sending this wish. Lovely birthday. Though I missed your birthday party, but it seems that I can hear the tunes of your birthday celebration in my mind. Hope you had some great moments. I’m so regretful that I couldn’t join your birthday party. Now I’m planning to eat 2 large piece of cakes to make that up. Doesn’t it sound good!! Your birthday rush so fast that I couldn’t manage any moment in wishing you on your birthday. Better late then never. Happy late birthday. I know I’m late in wishing you on that important date and that was your birthday. Hope it won’t happen never. I’m sorry that I could not communicate with you on time to wish you happy birthday. Still, I’ve a chance to wish a happy belated bday. This year you turned 30, so I thought that you wouldn’t celebrate your birthday. That’s why I skipped the wishing part. But I was wrong. Wishing you a belated happy birthday. Another year passed before I could buy a birthday card for you. That’s why I’m late to wish you happy birthday. 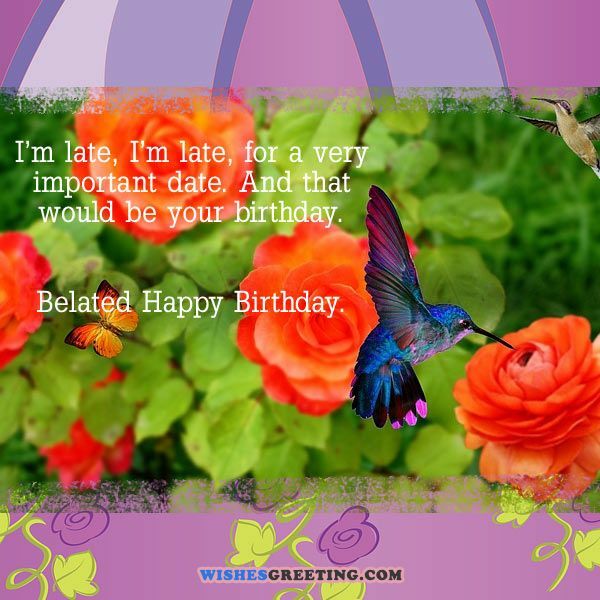 I was late in wishing you a happy birthday and you are also late in inviting me to your birthday party. Very best belated birthday. This year I’m late in wishing you a happy birthday. So, I’m wishing you again for the coming birthday and hope this time you won’t get any chance to say that I’m late. I want to wish you, happy birthday 11 months advance because I was late this year and I don’t want to be in the same situation in future. Happy birthday. I’m wishing you late so that your birthday celebration becomes longer than ever. Happy belated birthday. I know I’m late, but I still believe that you are having your gorgeous birthday. It seems to me that you had a birthday just yesterday. I’m really sorry that I’m very late in wishing you. Your birthday celebration was over before I could reach your home. Have a happy awesome birthday. Even though my best wishes could not reach to you on time, but it was just an accident. Hope your birthday celebration was an outstanding one. I’m not going to show any excuse for wishing you late, but you know that it wasn’t intentionally done. Happy best birthday. May be I’m a bit crazy or I’m wrong in some cases, but it’s almost impossible for me to be too late in wishing you a happy birthday. Though I don’t have the opportunity to wish you on your specific birth date, but still I’ve a chance to say you happy belated bday. I know that you planned for a week to celebrate your birthday, so I hope it would be continuing for this whole week. So, I guess I’m not late yet. A birthday party should be happening for at least one week for a person like you, because you are very serious about parties. A perfect birthday celebration includes some special things like some early wishes from beloved ones, a wonderful party with some people and then some late wishes from some of your true friends. All these are truly essential. Happy best belated bday. 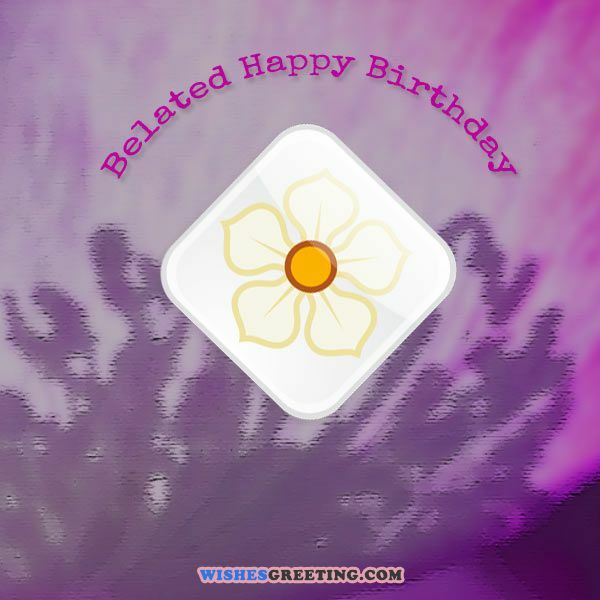 Check out these awesome belated wishes that we have provided here to say with style what you feel. Also we have provided as inspiration also belated bday images and videos. I’m sorry that my cat was stuck in the car, that’s why I’m late in wishing you a very happy birthday. Though my wishes reached your home late, but hope your celebration was an excellent one. Do you know why I’m late? I was seized by the aliens from mars. I came back a few moments ago and now wishing you a happy belated birthday. 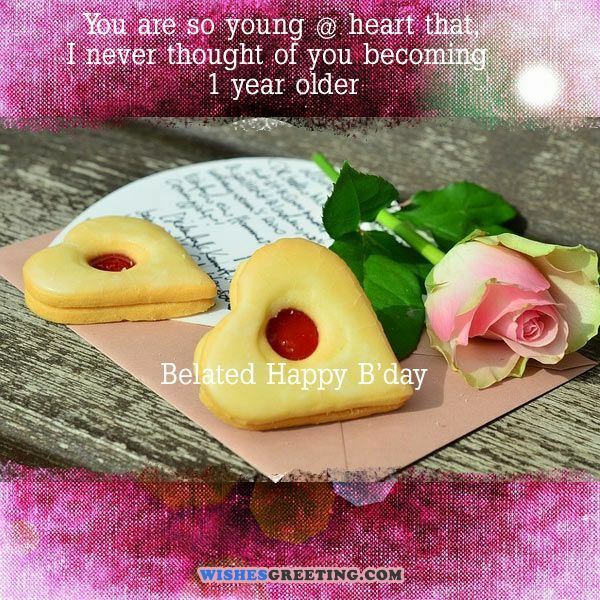 It is very tough to believe that you are getting older, so I decided to wish you late this year. I’m really sorry to be late in wishing you a happy birthday and I’m hoping to have a piece of leftover cake for me. I hope that you had a fantastic day with lots of colorful celebration. Have a happy belated birthday. I know you didn’t keep any cake for me, but at least show me some excellent photos of your special day festivities. May be I forgot to wish you, but hope all your wishes come true in the coming days. Awesome belated birthday. I know I’m little late, but I guess that I won’t be the last person to wish you a best belated birthday. I always loved the way you celebrated your birthday and I’m so unlucky that I missed it this year. I need a time machine to tell you, happy birthday on time. Hope you enjoyed the party. Last week it seemed to me that your birthday is too far, but it went away too faster than I thought. Happy awesome birthday. I believe you had a wonderful birthday and I’m sorry that I couldn’t join with you. I know you had some great times with your friends and family. I wish I could be there too. May all your dreams come true in this year. Happy late birthday. I’m late to wish you a happy birthday because I got stuck in the traffic jam due to some sudden accident on the road. I’m pretty sure that you were expecting a birthday wish from me on time and I’m really sorry that I couldn’t make it. Happy belated bday. I wish if you were born 3 days later than it could have been the first wish on your birthday. May be my greetings are late, but they are absolutely fresh. Happy belated birthday. I always keep thinking about your birthday. May be that’s why I’ve forgotten that special day. Sorry for wishing you very late. I hope my wishes are not too late or too early. Whatever, happy birthday. You know my life is a little crazy, but all I need is your support. Hope you had a wonderful birthday. This is the message that I was supposed to send you on your birthday. Please accept this and remain happy with love and wishes from all your family and friends. Look our hairs are becoming white. May be that’s why I’ve started to lose the memories. Happy belated birthday. Wishing a happy belated birthday to someone who actually deserves an “on time” wish. If I’ve mailed the birthday card on time, then it would have reached your hands on time. I’m sorry for that. Lets reveal a truth to you that I never forgot your birthday. I just couldn’t remember that in time. Happy belated bday. Though the time went away too fast, but I didn’t lose the birthday card. It stayed right on my table. Sorry for being late. Here are some belated birthday wishes for members of your family to say that you are still thinking about them on their special day. Spread the joy with these belated bday quotes. Happy Belated Birthday! I’m sorry I couldn’t be there with you. Next year I will be home, I promise. I love you. Hey, Happy Birthday! A day late. I know it’s been a while, but I just wanted to make sure you had a good day yesterday and to let you know I still think of you. Thank you for being born, it’s the best thing that’s happened to me. Happy belated birthday, I’m Sorry I’m late. No one can ask for a better person to have in their life than you. Happy belated birthday, I can’t wait to see you again. Happy belated birthday, mom. I love you! Thank you for all that you’ve done for us. I will see you soon, I’m sorry I couldn’t be there with you. A birthday is an important, irreplaceable day, but I like to be fashionably late so happy belated birthday! Dad, you’ve done so much for me over the years so I hope you had a good birthday. When I see you I will give you the biggest hug. Happy birthday! I’m sorry I’m late, but I want you to know you mean the world to me. Time and distance can’t keep us apart! Happy belated birthday, I wish you and your family the best. You have done nothing, but good for us. I love you, happy belated birthday. I’ll be waiting for you to come home soon. Happy birthday, grandma. You are a joy to have and I miss you every day you aren’t here. I’m sorry I’m Late, but my gift should make up for it! Grandpa, you are my hero. Happy belated birthday. I can’t tell you how much I love you and what you mean to me.